Al-Haram mosque is the most important of the city of Mecca, the first holy place of Islam and the biggest in the world. In its center it is Kaaba, where a black stone is embedded. This mosque dates back to the year 1570 it it has the shape of a central square surrounded by stone walls. Around the sanctuary there is a marble pavement, which is the mataf. It is said that the importance of al-Haram mosque was built in the year 638, when the amount of muslims increased, which led caliph Umar ibn al-Jattab to expand the place. It was since then that both the mosque and the city have gone through several changes, which reflects time. All this that surrounds Mecca makes reference to the fact that not in vain it is the pilgrimage place for excellence. When we talk about cosmology, Al Haram Al-Shérif was built by the angels during human creation to be the reflection of the land of Al-Baytu Maˤmur, a place of worship where it is believed that the angels are directly above the celestial Kaaba. This kaaba was destroyed and the person who rebuilt it was Adan, the human archetype whose responsibility is to reestablish the equivalents of the celestial Kaaba on earth. However, the deen of Islam was forgotten and it was necessary tfor the prophets and messengers sent by Allah to make a reminder of the former pact, which joins the creator with the creatures. Abraham, with his son Ismael’s help, was the last person in reconstructing Kaaba, which is the black stone originary from paradise, situated on the corner of Kaaba and its colour black is due to human sin, to give body to the human heart. The amount of times pilgrims go around the Kaaba are the same amount of circles you go around your heart as the headquarters of the intuition of One. That is why that what we find at Kaaba is the hint of majesty, an emptiness that fulfills perception. The first expansion performed to the mosqued takes place in Islamic times, which was under caliph Omar ibn al-Khattab’s control. Umayyad caliph Al Walid Ben Abdel Malek had a part of the land connected to the surface of the mosque. It was like that that the building was renovated, risen on Syrian and Egyptian marble columns mosaics decorated archs. Abbasí Abu Jaafar al Mansu was a caliph who gave the order that the surface of the Al Haram mosque was joined, ordering a circular corridor to be built. Then, caliph Al-Mahdi ordered to buy, because of his pilgrimage, 776 houses situated between Al Haram mosque and Massaa, which were demolished to join the land to the mosque. That is why the surface was broaden to 120,000 square cubits. In times of caliph abasida Al Moutadid Billah and its successor, caliph Al-Muqtadir Billah, this surface was broaden with the importance of al-Haram mosque and reached its summit in the year 306 of the Hegira remaining without changes until the saudi era. No changes in the reigns of Fatimids, Memelucos, Ottomans and Ayyubids were made in the Al-Haram mosque and the jobs were not limited to repairments and restoration. With king Saud ben Abdel Aziz Al-Saud it was proposed that in 1955, a very important programme of enlargement and reconstruction of the mosque, the same as with the restauration of sanctuary Kaaba. So, at the beginning of the ’60s, the total surface of the mosque was near 200 m2 (being that before it was 30,000 m2), holding 400,000 pilgrims simultaneously. King Fahd Ben Abdel Aziz Al-Saud continued with the enlargement work, which led to 320.000 m2 of the sacred mosque, which led to have the capacity of holding more than a million pilgrims a the same time. In the latest years, the Haram of Mecca has suffered the impact of the titanic constructions performed around it and which tend to dwarf Kaaba and to visually impose the presence of power that has empowered of Mecca. 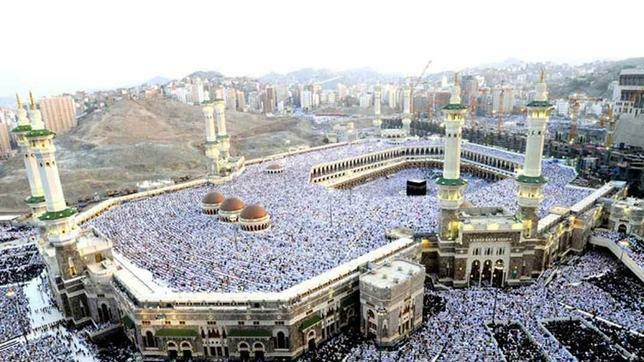 Mecca is the most important city of the region of Hijaz and one of the most important of Arabin peninsula. Its name comes from ‘worthy’, its original and complete name, which comes from Islamic times is Makka al-Mukarrama, which means ‘ennobled Mecca’. It is the city where Muhammad was born and it is visited by millones of believers of Islam every year. Before Muhammad preached Islam, this was already a holy city with different places of religious importance, among which the most important is Kaaba. Kaaba is the most important holy pilgrimage place of Islam, it is known as ‘the house of God’, where the Divine gives presence to the earthly. It is towards this place where muslims from all around the world gather to pray. However, Kaaba and the black stone are not worship objects of Islam, Allah is the only who they worship exclusively. The place was founded 2,000 years before our era and it is attributed to Abraham and his son Ismael. The name Kaaba in English is ‘cube’, which makes reference of the object, which is 10 meters long, 12 meters wide and 15 meters tall. It has only one door and it is covered by a black silk mantle covered by gold scripts from Koran. This coverage is called ‘kiswa’ and it weighs approximately 420 kilos. It is held by cords to the bronze rings which are in the base of the center of the basilica. More information in the photograph.